Manassas Events to Attend Before Summer Ends! Summer is quickly coming to a close and there is no better time to take advantage of the amazing weather and summer events right here in Manassas! While you’re hanging out downtown, you can also enjoy a local restaurant and do a little bit of back to school shopping! Just a few miles from Arcadia Run, Downtown Manassas is the place to be seen, so check out the remaining summer events happening soon! The last Family Movie Night this summer is sure to be one of the best! If you’re looking for something to do with the kids on Friday night, this is the perfect opportunity to get them out of the house! Get a 10% discount at participating restaurants downtown for takeout food and enjoy a relaxed concert setting while you eat and listen to tunes. Bring the kids over to the Harris Pavilion for free ice cream after a show played by one of our favorite local orchestras. Enjoy a festival of food, games, music, vendors and fun for the whole family provided by the First Baptist Church! Experience history first hand with live reenactments, educational activities, tours, food, music and more! A perfect event for the whole family, pick and choose which events to go to this weekend all throughout Manassas. Join us for an adults only dance party at the Harris Pavilion while jamming out to this local group. 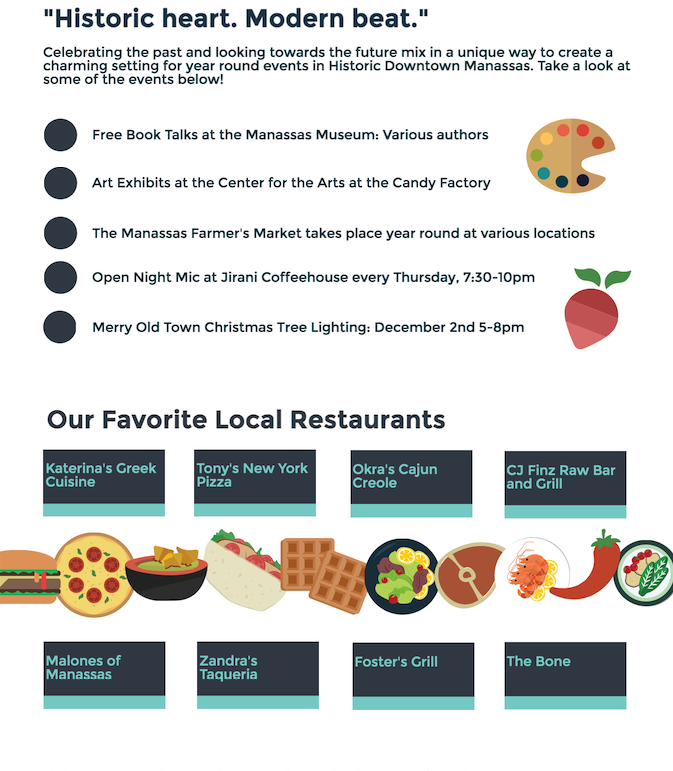 Celebrate Manassas’s last First Friday this month with activities and specials going on in shops and restaurants throughout the town. Now officially in it’s 7th year, Bands Brews and Barbeque is the perfect end of the summer celebration. What more could be better than great music and great food? In addition to the year round farmer’s markets, don’t miss the last few summer farmer’s markets ending soon! In its 42nd year, join the community for an antique car meet to see some of the coolest rides around. Just to add to your musical entertainment options for the summer, come on over to Battle Street to dine at your favorite restaurant while enjoying a new band each time! View the schedule here. Now that you have a full list of events happening over the next few weeks, it’s time to fill up your calendar and make the most of the warm weather here in Manassas! Where to Celebrate National Beer Day in Manassas! Calling all beer lovers! 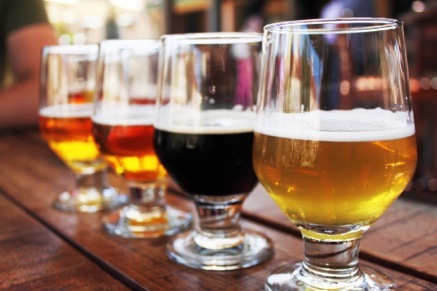 National Beer Day is on April 7th and there’s no better way to celebrate than heading to a local brewery for some delicious brews! 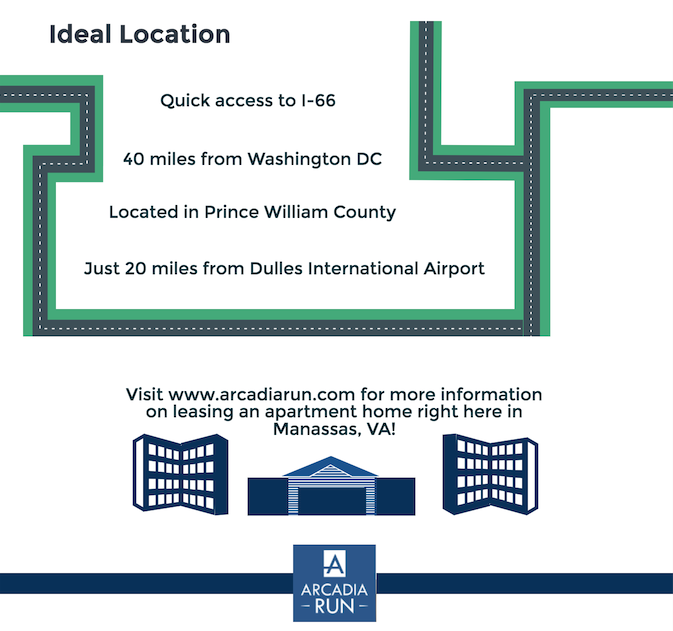 Arcadia Run, located in Manassas, VA, is just minutes from some of the best breweries in the area. From local favorites to exciting newcomers, you’ll have no problem discovering something delicious on tap. Check out some of our favorite breweries in the area, plus a sneak peek at a few that will be opening soon! Heritage opened its doors in 2013 and hasn’t looked back since. Owned and operated by military veterans, this isn’t your typical brewery. Their flagship beers, such as the Freedom Isn’t Free IPA or the Revolution American Amber Ale, pay homage to the USA with American-themed cans and names. Their rustic styled taproom lets you see the tanks your beer came from, and is great place to gather with friends. Heritage offers brewery tours on Saturday’s only, so get there early to get a ticket, which are a deal at $5. They also have a new brewpub and roastery opening soon in Clarendon! Founded by local husband and wife team Jeremy and Sarah Meyers, Bad Wolf Brewing is on a mission to provide Manassas with delicious unfiltered and unpasteurized beer. With a rotating selection of craft beers at their TWO taprooms, Little BadWolf and Big BadWolf (extra points for puns), beer aficionados have their pick of IPA’s, porters, sours, and much more. BadWolf also offers multiple events every month, from paint and sip nights to fundraisers. BadWolf Brewing has been such a success that they decided to expand! BadWolf Public House just opened this spring in Old Town Manassas, and focuses on pairing their signature brews with locally sourced ingredients. They are still waiting for their new brew house to be installed and licensed, but in the meantime, diners are clamoring for the French onion soup, Reuben sandwich (proclaimed as the best around!) and the smoked mac and cheese. Stay tuned for their brewery opening! Located just 7 minutes down the road from Arcadia Run, Tin Cannon Brewing Co. (TCBC) is a local favorite. Their creative approach to brewing has led to the development of some of the most unique beers around. You can find a rotation of 10-12 beers on tap, such as their Unkel Dunkel Dunkelweizen, Vaughn’s Peanut Butter Porter, or Guardians of the Galaxy IPA. TCBC is closed for brewing Monday-Wednesday, which tells you exactly how serious they are about their beers! Come May, they’ll be opening their new 8100 sq. ft. brewery and production facility, meaning you’ll be able to find TCBC cans in stores throughout Northern Virginia. 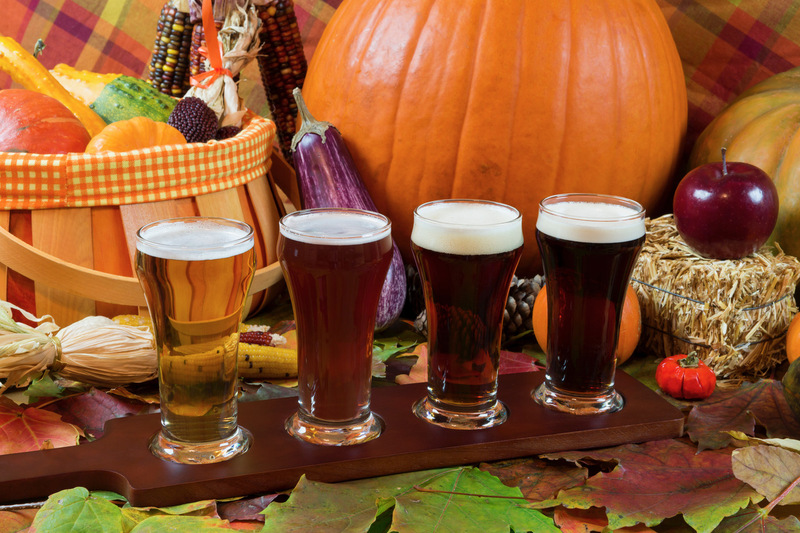 Grab some friends and head out to discover one of the great breweries located near Arcadia Run. Please drink responsibly and do not drink and drive. Spring is here in Northern Virginia and we couldn’t be more excited! 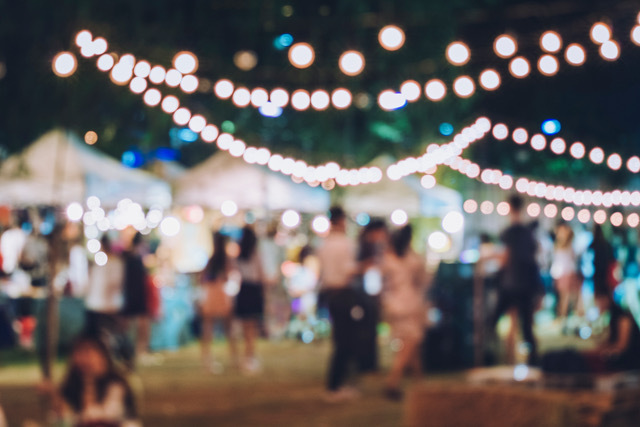 While we have fun outdoor spaces right here at Arcadia Run, our location in Manassas, Virginia positions our community just minutes from some amazing outdoor spaces for entertainment and fun. Check out some of our favorite outdoor activities and places to visit this spring right here in Manassas, VA! Take a day to stroll the streets and pop into cute boutiques when discovering Old Town Manassas! The Visitor’s Center will have any information you may need and is great starting point for your day. 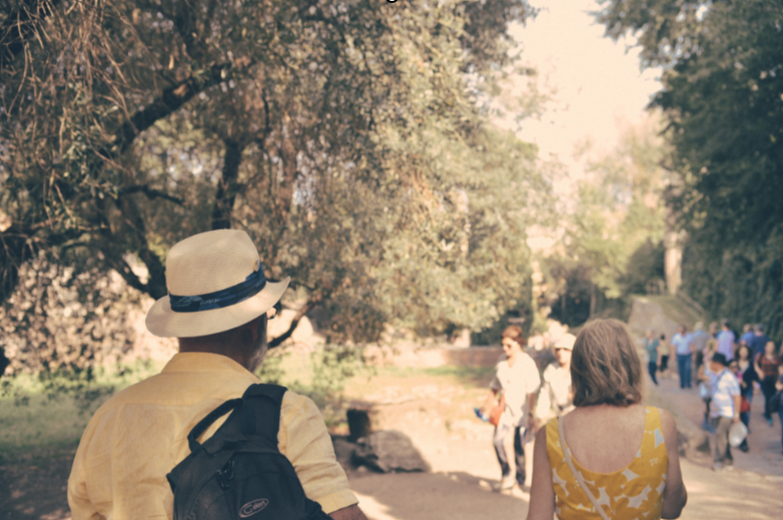 Walk around the historic streets and check out the local museums, galleries, and turn of the century architecture at every corner. Once April comes around, head on over to one of Northern Virginia’s longest running farmer’s markets! 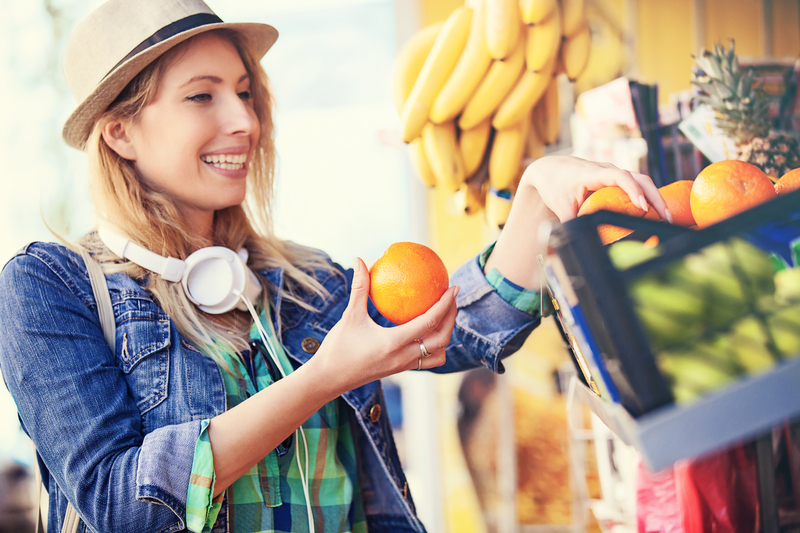 Pick up fresh fruit and vegetables, or browse different crafts and home goods. Check out their website for a full list of locations and times. If you want to take in some history while exploring beautifully manicured grounds, head over to the Ben Lomond House! Built in the 1830’s and used as a hospital after the Battle of Manassas in 1861, Ben Lomond is a treasure trove of rich history and information about the Civil War in Manassas. Spend a perfect spring day walking the grounds and be sure to see their beautiful Old Rose Garden, home to one of the largest collections of Old Garden Roses in the DC Metro area. 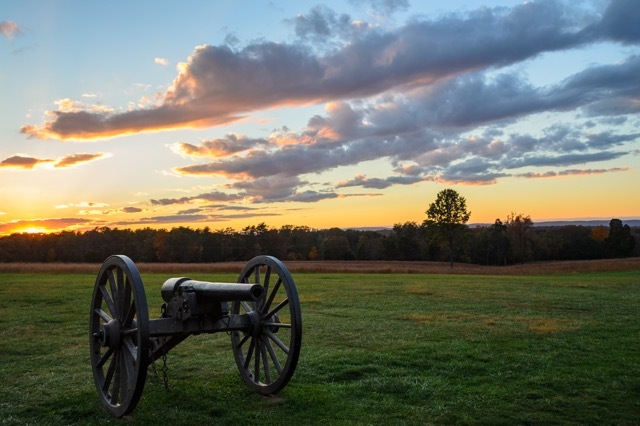 Listed as the #1 ‘Thing to Do” in Manassas on Trip Advisor, these battlefields were the site of some of the most important battles during the Civil War. Take a walk through time while traipsing across the open battlefields of Manassas, which offer over 40 miles of hiking trails. Stop in the Henry Hill Visitor Center for maps, information, and souvenirs! After working up an appetite from all your outdoor activities, head on over to Okra’s in Old Town! Serving up authentic creole cuisine straight from the bayous of Louisiana, you wont want to miss out on their crawfish etouffe or alligator bites. Spend a warm spring Saturday evening at one of their outdoor tables listening to some great live local music. Check out their website for a full list of events. Nothing says warm weather and springtime like fresh seafood! Located right in Old Town, CJ Finz is the go-to place for seafood and local coastal fare. Sip a local draft beer while catching a baseball game, or soak up some rays on their second level deck area, the only one in Manassas! Bring the family or some friends for a fun afternoon and evening at Finz. There’s nothing better than a warm evening surrounded by friends and listening to live music! 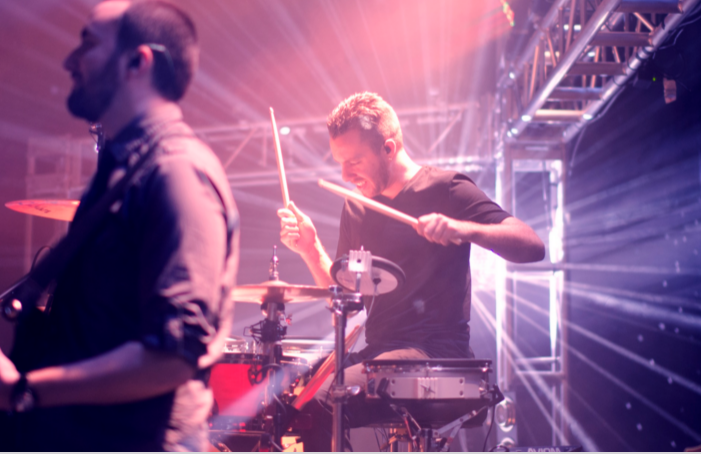 One of Virginia’s premier music venues, Jiffy Lube Live is located just minutes from Arcadia Run. Check their list of concerts and events for the spring and summer months, and get your groove on! For more information about our great apartment homes, visit Arcadia Run online. 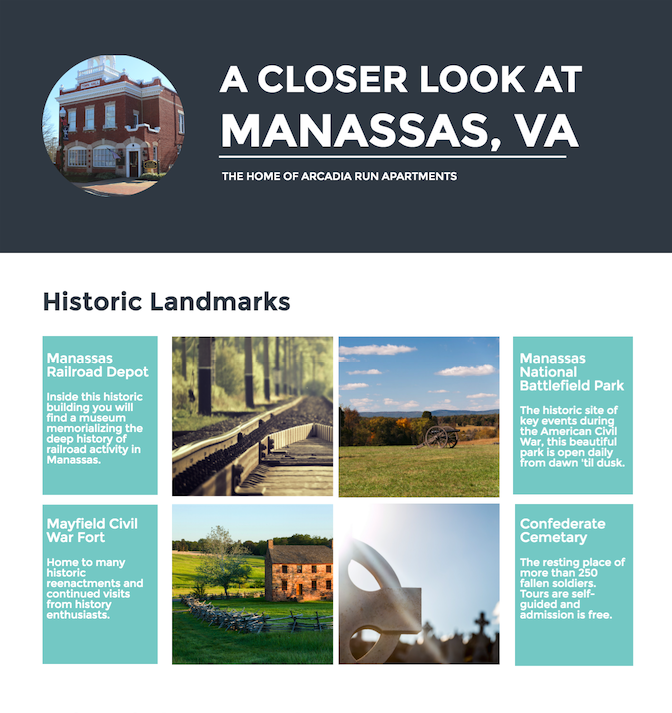 We love being located right here in Manassas, Virginia, but do you really know all of the amazing things about this historical town? 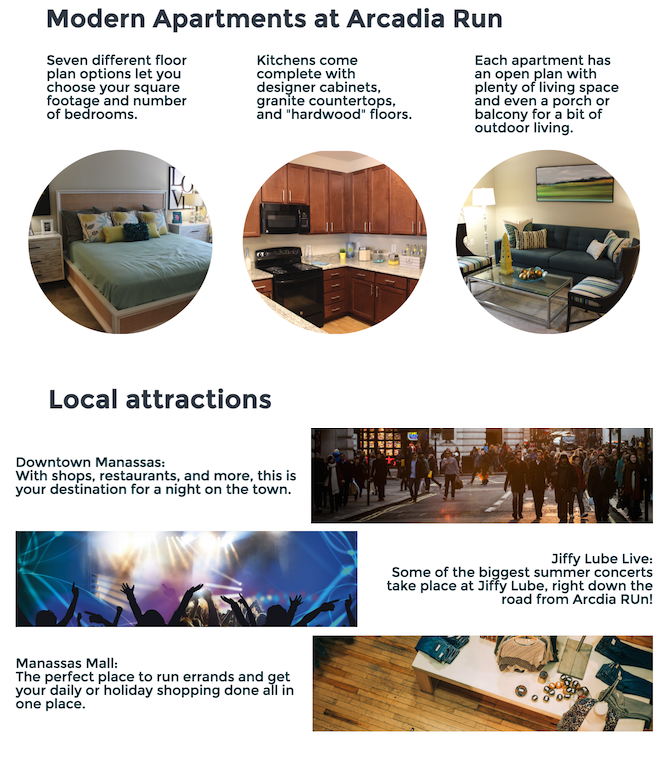 Check out our latest infographic to learn even more about Manassas! Free Things to Do in Manassas This Summer! So maybe you have been spending too much money shopping for the perfect summer wardrobe, or you recently invested in a brand new car. Just because you are attempting to save some money this summer, doesn’t mean you can’t get out and enjoy the season! Because Arcadia Run is located in Manassas, VA, just minutes from downtown, there are plenty of free events and attractions to keep you entertained all summer long! Right around the corner from Arcadia Run, is our favorite entertainment venue Jiffy Lube Live! Check out the infographic for some fun facts about the venue and all of the upcoming shows happening this summer! Quiz: What Is Your Apartment Style? When you move into your new apartment home at Arcadia Run what do you picture it looking like? Take the quiz below to find out what your apartment style is! 1. What would your coffee table look like? 2. What TV show are you most likely to watch in your apartment? 3. What would you most like to hang on your wall? 4. What excites you the most about Arcadia Run? 5. What does your bed/bedding look like? 6. What would your welcome mat look like? 7. What feature attracts you most to an Arcadia Run apartment? Mostly A’s – Your apartment style is Traditional: You stick with what you know and like traditional décor and features. Mostly B’s – Your apartment style is Modern: The more geometric and technologically advanced, the better! Mostly C’s – Your apartment style is Eclectic: You love to collect anything and everything that catches your eye creating a mix of cultural décor. Mostly D’s – Your apartment style is Boho: A modern day hippie, you connect best with music and nature, which your apartment style reflects.